The elegant wing profile of Let D appears like it is flying over the table or counter. With the telescopic height adjustment and swiveling ball-and-socket joint, the light can be set in many directions. The brilliant light with the very high efficiency of Power-LED sets new standards in office and living areas. With the button on the side, the lamp can be dimmed in 5 stages. 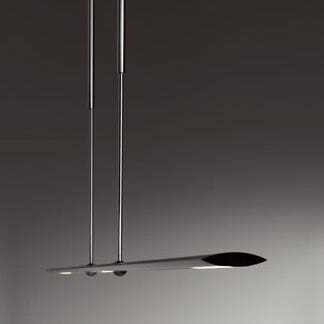 Sides in aluminum 37 x 8 mm, pendant is height adjustable 1000-1800 mm. Ceiling plate aluminum, integrated transformer. Max. 1500 lux / 3500-4000K / 35 W | light bulb: 3 x 4 power LED white / 1200 lumen. ​Awarded with the Minergie award, Design Plus award by light building and the iF product design award 2009.
the lamps are produced in small series from 100-1000 pieces. Do you have a question about "LET D"? How can we contact you?